I am also eager to share with the conference attendees the promising preliminary findings of my CSUN research team’s experiments on whether my documentaries could make a difference in how people perceive discriminated minorities. The documentary feature film LGBT UNITED by CSUN psychology professor and filmmaker Luciana Lagana, aka Dr. Luciana, continues to be successful on the film festival circuit. It will screen on Thursday, September 1st at 5 pm at the Long Beach Indie (LBI) International Film Festival 2016. (from the festival’s website): Celebrating global diversity, the Long Beach Indie International Film Festival takes place August 31-September 4, 2016—this Labor Day Weekend!—at the Cinemark at the Pike Theaters in scenic Long Beach, California. Since 2014 LBI has screened more than 400 films from more than 50 countries, drawn more than 4000 attendees, and drawn Oscar, Grammy, Emmy, Golden Globe, AMA, DGA, ALMA, and NAACP Image Award winners and nominees as presenters. Dr. Luciana’s social impact documentary has received two award nominations at this festival, for Best Documentary Feature and for the Special Sons and Brothers Award for positive and balanced depictions of young men of color presented by The California Endowment (TCE). 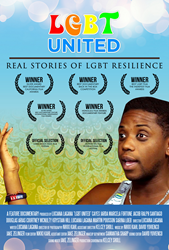 (from the IMDb website): LGBT UNITED is a documentary on the challenges encountered by LGBT individuals in their childhood, at school, when coming out, and in many social settings. The viewer will experience the multiple struggles and discriminatory experiences of this minority population vicariously, thanks to the candid interviews of many LGBT volunteers. In spite of all their challenges, their serenity and resilience is remarkable. Dr. Luciana and LGBT experts share their views on some of the many controversial topics that surface during the interviews. The result is a compelling movie that focuses on the need for unity within the LGBT community and within society, as we stand united to protect human rights = LGBT rights. At LBI 2016, in addition to screening LGBT UNITED, Dr. Luciana will be part of a group of 100 top scholars and entertainment industry presenters at the LBI Film, Media, and Music Conference. She will present the pilot findings of her CSUN research team on using films to change negative perceptions of discriminated minorities. (from the festival’s website): Long Beach Indie 2016 includes LBI Film, Media and Music Conference, September 2 through September 3 — Long Beach Convention Center. Love film, television, digital media, or music? Want to make it in the entertainment industry? International scholars and entertainment industry leaders talk about the past, present, and future of the film, digital media, and music. Conference’s Block 23 - Going Deeper: How Archives and Research Can Help Make Better Films and a Better World. Her presentation is entitled: Using Social Impact Research Films to Help Improve Quality of Life. Location: Room 102C at the Long Beach Convention Center (300 E. Ocean Blvd., Long Beach, CA 90802). In her presentation, Dr. Luciana will focus on discussing pre-test to post-test changes in homophobia scores within a sample of young adults who viewed LGBT UNITED. She will also discuss whether viewing her first feature documentary, the multiple award winner UNDERSTANDING PAIN IN OLDER AGE, could have a positive impact on how young audiences perceive older adults. “I look forward to screening LGBT UNITED at the Long Beach Indie Film Festival and to participating in the Q and A post-screening session. I am also eager to share with the conference attendees the promising preliminary findings of my CSUN research team’s experiments on whether my documentaries could make a difference in how people perceive discriminated minorities,” shared Dr. Luciana. The link to LBI 2016’s schedule can be found at http://www.longbeachindie.hollywoodpost.com/schedule-2016-long-beach-indie-intl-film-festival. The Winners of the LBI 2016 Film Festival Awards will be revealed at the Sept. 3 Gala. The full list of LBI Award nominees is available at http://www.longbeachindie.hollywoodpost.com/archives/2047. Luciana Lagana is a caring clinical and experimental psychologist. She is also an established professor of psychology, gerontology, women’s health and sexuality at CSUN, where she teaches classes and mentors many undergraduate and graduate students. Additionally, since 2002, she has been conducting government-funded research on the physical, psychological, sexual and social health of ethnically diverse, primarily low-income older women. Since 2006, she has also been pursuing her creative endeavors by studying acting, TV and radio hosting, screenwriting, directing and producing in Los Angeles. She has over 50 IMDb credits for hosting and acting in many independent feature films, TV pilots and web series as well as several credits for her award-winning screenwriting, directing and producing. She is the writer/lead actor/director/producer of the 2014 award-winning fictional web series INTIMATE TEMP AGENCY, which also won Best Trailer at the 2015 Hollywood Reel Independent Film Festival. Her 2014 DR. LUCIANA SHOW – AGING AND FALLING web series won numerous awards, including Best Educational Show at the 2015 WorldFest-Houston International Film Festival. Within the past year, she wrote, hosted, directed and produced three award-winning social impact feature documentaries, UNDERSTAIND PAIN IN OLDER AGE, LGBT UNITED and AGING AND FALLING, which are currently on the film festival circuit.